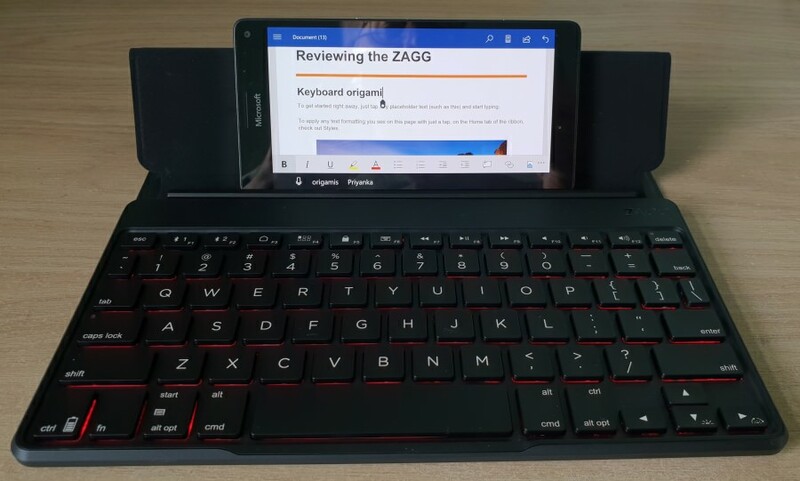 Back in 2016 I looked at the ZAGG Pocket Keyboard, a jacket pocket solution that used multiple hinges to provide a narrow form factor - it worked, but it wasn't 'lappable' and the sheer number of ribbon cables and multiple points of failure was a little worrying. 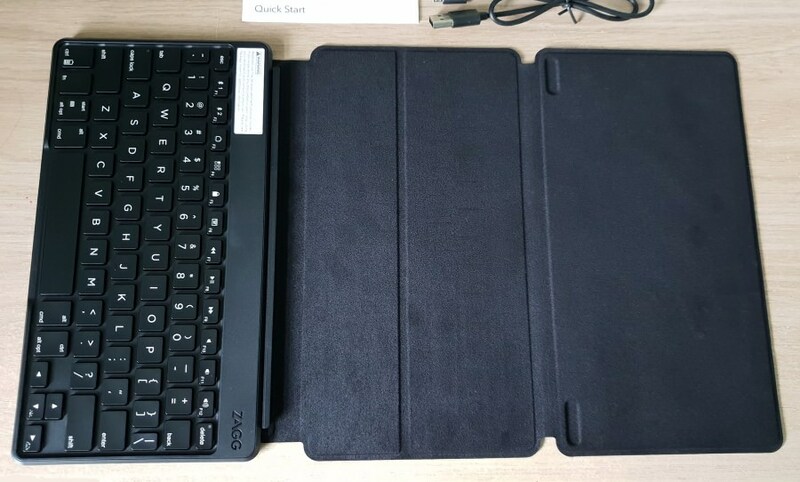 Fast forward two years and we have the new ZAGG Flex, taking inspiration from the multiple two-in-one keyboard designs for tablets that turn into 'laptops'. With the Flex, your phone can be your tablet or laptop too. Or - you know - use a tablet as well. Regardless, the Flex is superbly made and possibly my new favourite Bluetooth keyboard solution. Bit by bit, Bluetooth keyboards have grown up over the years. Li-Ion batteries, dead simple pairing, multiple OS and multiple device support, heavily configurable backlighting, premium materials, greater durability. 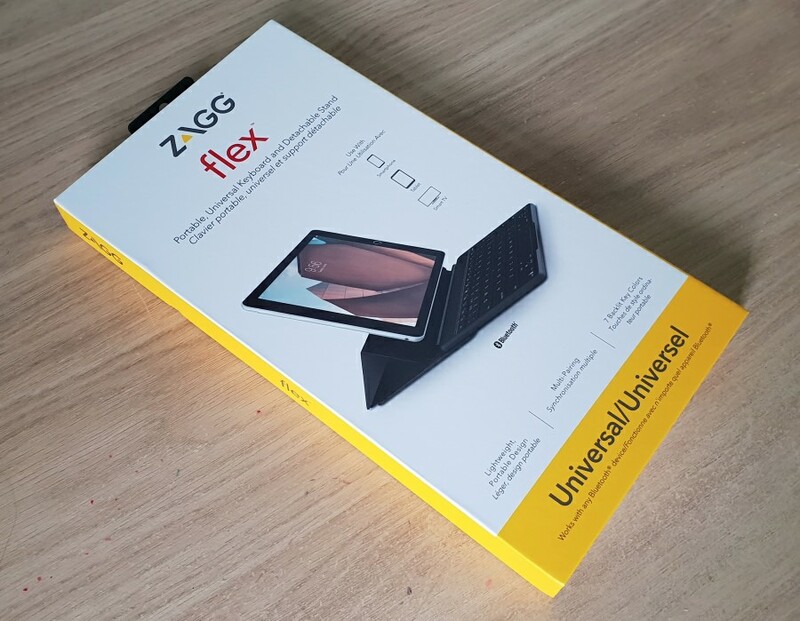 Put all of this together and you end up with something like the ZAGG Flex, which offers a new folding design that's suitable for any tablet or smartphone and fits neatly in any folio or other slim case. 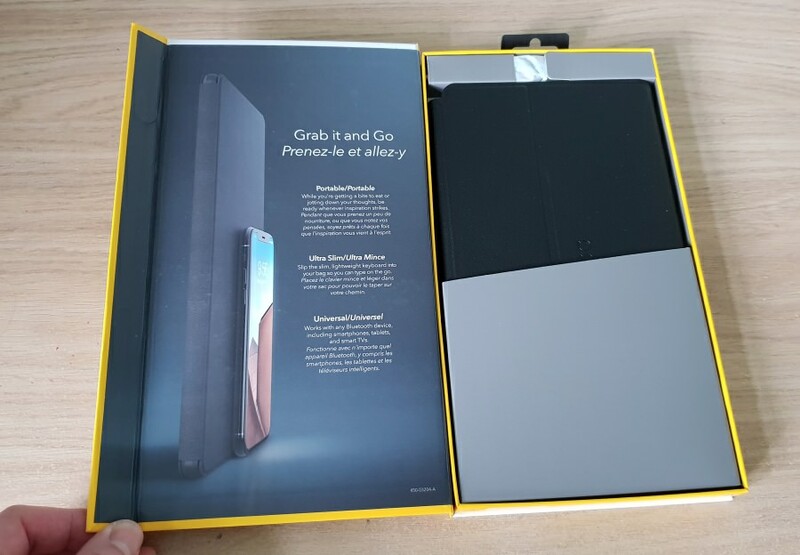 Premium packaging creates a great first impression, even more so when you take the folded Flex out of the box and feel the textured and rubberised finish - this feels very hard wearing and, with precisely zero ribbon cables, you never have to worry about something flexible breaking in the future. The biggest caveat to the Flex comes next - and it's a biggie, though will only take a short while to get used to. Unfolded, you look at the Flex design and then at the box and think "How the heck does this fold to make that?" It took me a good couple of minutes to work out the first time - a veritable Rubiks Cube puzzle - 20 seconds the second time and then I knew what to do after that. Have a look at the photo below and see if you can work it out!! In short, you fold the large flap underneath the other sections, popping the middle flaps up into a triangular structure. Once in place, the bottom flap is held in place strongly with magnets. In fact, you can even detach the keyboard from the stand folds, should you need to, for example for a large lablet, where you don't want to be too close to the screen. The system works well for my Lumia 950 XL shown below, though I also tried it with my Samsung Galaxy S9+, with good results. The 'groove' above the keyboard is large enough for every phone or tablet that I tried it with and the overall experience is about as good as it gets, within the constraints of using a 6"-screened phone and a 9" wide keyboard system. Happily, Windows 10 Mobile is very good at presenting most applications in landscape mode - after all, it's a proper computer OS, unlike Android, where more applications struggle with landscape. The ZAGG Flex is also 'lappable' in that the magnet-strengthened structure and rigid panels make it rock solid on the lap, i.e. you don't need a table, which is normally the case with many other (side) folding designs. 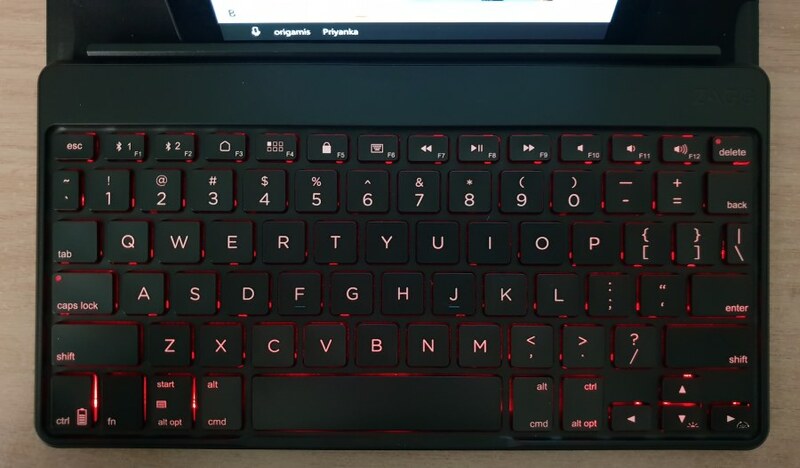 This being a full six row keyboard, there's room for loads of extra control keys, not least of which are two Bluetooth controls (so that you can keep two devices regularly paired and switch between them as needed), a 'Home' key (which doesn't work under W10M), a 'Recent apps' key (which does work, though it's somewhat pot luck as to what you select since the animated cycling through applications is lightning fast! 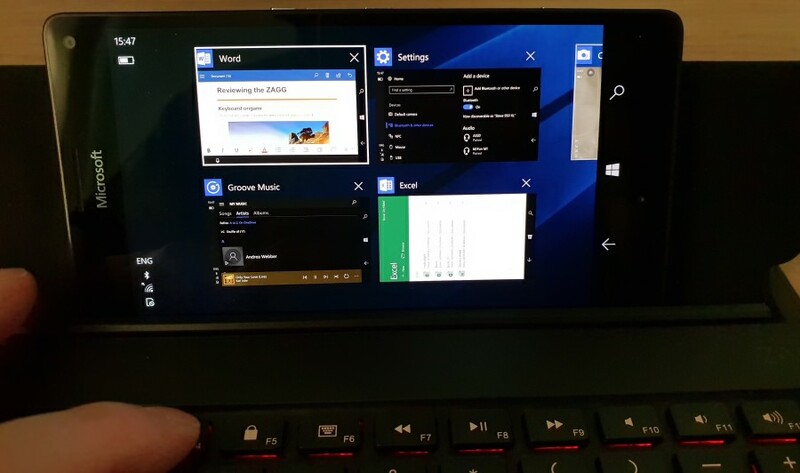 ), 'Lock' and 'Keyboard' keys (not really used in this context) and then media control and volume keys, which all work perfectly on both Windows 10 Mobile and Android. Key travel is excellent, at around 3mm, and each key has its own microswitch. So, although the keys aren't quite full size (I estimate about 90%), they're easily close enough that you'll type at full speed. I estimate that they're close to the keyboard on the Surface Go, more of which next week on AAWP. As with the Pocket Keyboard before it, one regional thing is that if you want to get the " and @ characters just right 'by feel' then note that this is a resolutely US key layout and so you need to set your keyboard to 'English (USA)' in the phone's Settings/Language/Keyboard. Which then may have other repercussions, depending on how you use your virtual keyboard(s). And, as usual, non-English speakers will have to adjust further. Oh well, you can't please all the people all the time, I guess, and this isn't enough of a mass market product to allow for regional variants. There are some lovely mature touches, such as the battery indication being displayed with flashes of a LED on the 'Delete' key, or the way the backlight can be adjusted through three brightness levels and six colours. 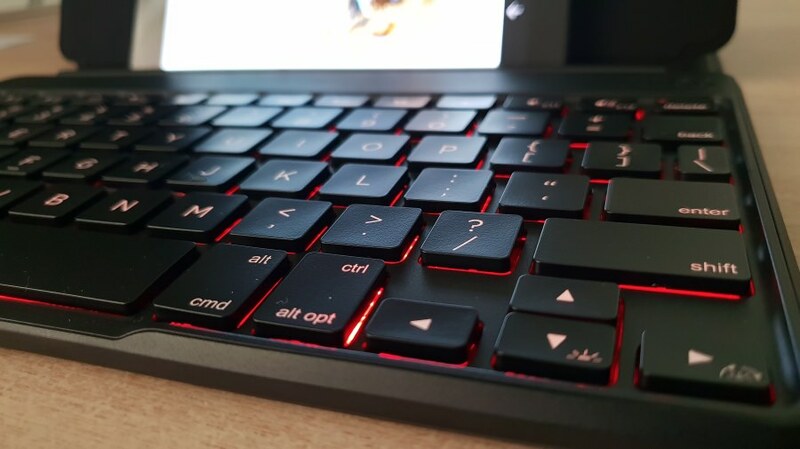 And a shout out to the backlight - ZAGG is in the top tier of keyboard accessory makers and the key illumination is perfectly even, with just the odd glimpse of something brighter around some of the keytops. I've reviewed some backlight shockers in the past, but this is one of the best. 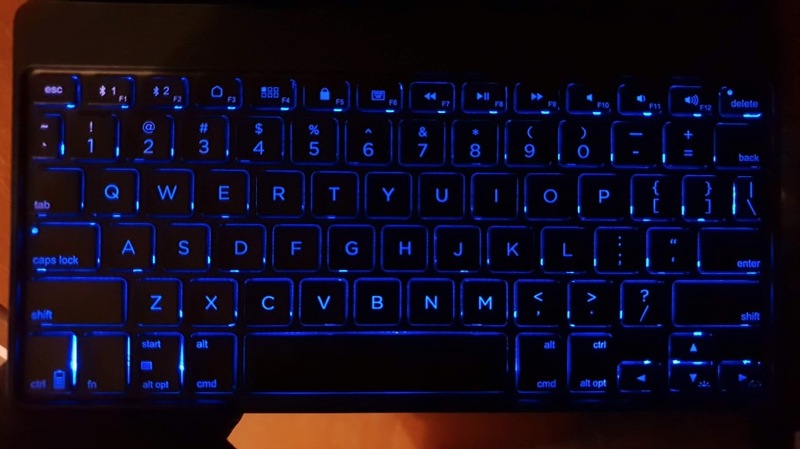 The backlight comes on immediately that you connect up to a phone or tablet, obviating the need for a status LED - unless you choose to turn the backlighting off completely, perhaps to save battery. 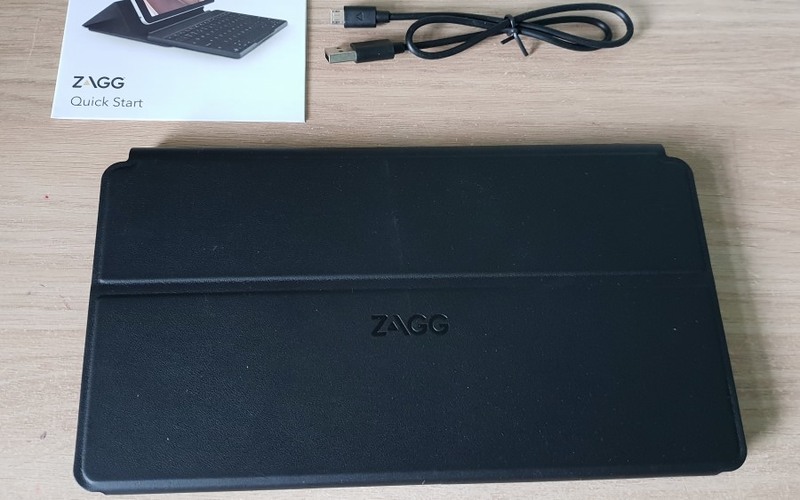 Overall, at £70 (or $70 in the USA), the ZAGG Flex is good value, when I received the review sample I was bracing myself for an even more premium price and the current level seems eminently reasonable. This is an age when most 2-in-1 makers charge between £100 and £200 for their add-on keyboard, so being able to kit out any portable device for significantly less is a nice change. The Flex isn't quite available in the UK yet, though see the link at the top, but I think it's going to be a big hit for ZAGG, which just managed to displace the iClever Tri-Fold in my briefcase!